I look forward to Die Burger each year – it’s the last organised ride, follows a wonderfully scenic route, and is also a seeding ride for the Cape Argus. One final chance at getting an earlier start time for the big finale to the summer cycling season. Originally when planning to do the DC, I’d foolishly assumed I would skip Die Burger this year, with it being just one week later. When the entries opened however, I just couldn’t imagine not taking part. So I bargained one last weekend of racing from my long suffering partner, Yoli. Not that she complained much, since she haggled an early, and more extravagant than usual birthday present – a nice shiny Kenwood mixer which now takes pride of place in the kitchen.. 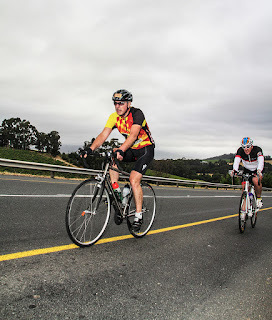 I normally struggle to use the term “race” when describing organised bike rides, because in truth the term “fun ride” better sums up the spirit I and many other riders enter and ride them with. For the first time though I feel at least a little bit justified in calling it a race. Not because I’d be up front racing for honours, but lining up in start group E put me only a few groups behind the real racers, and would mean fast bunches to improve the chance of a decent time. Better still, in amongst those fast riders were six fellow Wannabees, from our DC team and training rides: Adele, Alita, Desiree, Elizna, Peter and Theunis. As we chatted to wile away the time until our 06:12 start, it became clear that I wasn’t the only one hoping for a good time: Adele had done a 3:08 the year before, and was looking to improve her time, even if only by one minute. I’d set myself a target of 3:15, but I didn’t mention the fact that I was really hoping for a faster time – having spent most of the typically sleep interrupted night before dreaming about a first sub 3 time. It seemed outrageously arrogant to mention it when this race last year was the first time I’d managed a sub 4, with a time of 3:48. So I kept quiet on my real ambition. Pacing Die Burger is very tricky. It starts with an initial lung busting 6.5km climb almost immediately off the line. The risk with going out too hard at this, the only real climb of the day is not leaving enough fuel in the tank for a testing 40km of rolling hills back from Wellington at the end. Each of us had our own ideas on race tactics, so we had agreed not to try and ride as a group but rather follow our own pace. As we set off though, Alita and Elizna were both around me and we stayed largely together over the opening ramps of Helshoogte Old Pass. As the road wound and pitched up the wonderful wooded hillside, Alita’s climbing pace was a little stronger than I wanted to go at this early stage, so I sat back into a steady climb. Elizna was also obviously concerned about pushing the pace too much, and we exited the old pass and crossed the last few metres of the climb together. Looking down at my Garmin, I was glad I’d only mentioned my 3:15 target in the start chutes. The split given in the race pack at the top of Helshoogte for a sub 3 was just 19 minutes. We were already 3 minutes slower than that with 85kms of riding still ahead. Dwelling on it wouldn’t help though, so I shifted to my big plate on the front, stood on the pedals and rapidly worked through to small cog on the back as we picked up the pace and sped into the descent. Wind rushing past us as our speed crossed 60km/h, I shouted across to Elizna that we needed to find a bunch for the stretch into Paarl after the downhill, which would be a fast section but also likely to be into the wind. It wasn’t looking promising though, with no obvious groups around us. After the short incline before the run down through Pniel it struck me we were gaining very slightly on a bunch some way ahead. At just that point a guy clad in white, on a white bike came past only slightly faster than us. With three of us now, we could probably catch the bunch ahead – so I pulled alongside and shouted across that if we worked together we could chase them down. The next few kilometres were a painful, lung and thigh busting blur as we ignored the opportunity for a nice easy free-wheel through the village, and instead charged at full speed towards the tail of the group ahead. Slowly, as we alternated turns between myself, Elizna, and white-clad-cycle-guy, we reeled them in metre by metre, and as the road flattened past Boschendal we finally caught them. I was impressed with how quickly Elizna ignored the temptation to sit at the back of the bunch, and immediately hopped into the thick of it in the middle. She’d clearly learnt a lot from our recent rides about the horrible concertina affect at the rear of groups, and sensibly gone for the typically steadier pace towards the front. As we swung left onto the R45, I was having a few concerns over just how much energy and muscle power I’d burnt up, with a long ride still ahead. I knew it was the right move to ensure we kept a good speed up until Paarl, but I was suffering way harder than normal for such an early stage of a ride. That was when I realised that for the first time I was experiencing the real difference between riding and racing – pain. On fun rides, when it hurts, you sit up and take it easy. But not today, I was already hurting, but with no intention of backing off I bit down hard onto my lip, rode harder, and stuck with the bunch. At least the reward was there to see, our pace was improving and not far ahead I could see another large bunch which we were slowly overhauling. I presumed we were hunting down the tail of a slower bunch of C and D riders. We caught them around the right turn onto the R101, and as we headed towards Paarl circle chaos ensued. This wasn’t a bunch any more, but a full on Peloton – everywhere around me were riders, literally hundreds of them. Negotiating the right turn around the circle was a nervous, potentially ride-ending affair, with at least ten riders abreast sweeping around the circle at a crazily fast speed for the number of riders and tightness of the bends. At least the clock was more promising – we hadn’t slipped back, and were still only 3 minutes off the official sub 3 split time of 55 minutes at the circle. 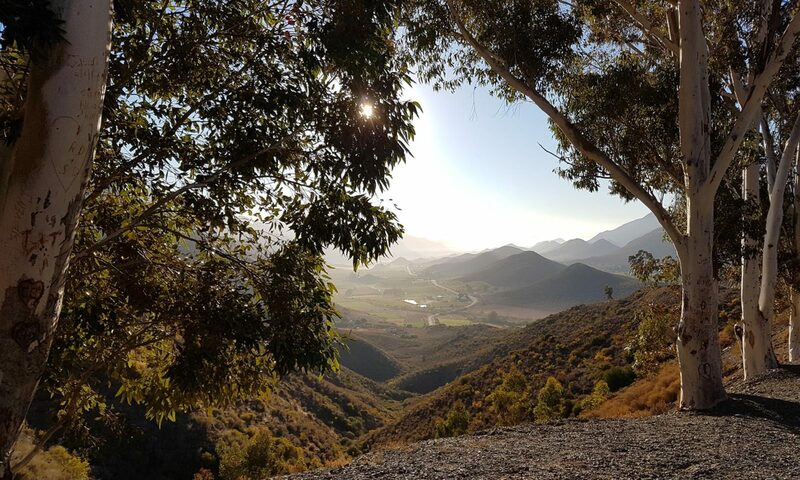 Desiree also now joined Elizna and I, having clearly had a good run down from Helshoogte – it was great to have a chat with friends as we headed through Paarl and towards the pretty vineyard lined section around Klein Drakenstein. This stretch of Die Burger has been a bad patch for me in previous years, it’s slightly uphill and always seems to suffer with the wind. This year was no exception, and as Elizna kicked to stay in the bunch to help battle the wind my legs just wouldn’t respond – in the blink of an eye, I was dropped. In a few minutes I’d gone from being surrounded by a ring of racing riders, to riding completely alone along a leafy lane between wineries. If this were a fun ride, I’d have been delighted to enjoy the serenity with just one or two riders around me. But I was gutted. The clouds looming over the mountain were heavy and grey, the wind was freshening into my face, and despite my average speed being close to the 30km/h needed for a sub 3, I was currently battling to even make 25km/h. It felt like less than half way in my race was already over. Regardless, I pushed on, catching the occasional glimpse of the bunch ahead, tauntingly close still but way too large a gap to be closed solo. One thing I have learnt from past rides though is that when you get dropped from your bunch, dial back a gear, get some strength back into your legs, and be ready for the next bunch coming through. And sure enough, the first riders of that bunch started to pass me just before the last rise of Sonstraal Road as it swings left back towards Paarl. For one brief moment, my fun ride mentality surfaced and I considered letting them go past rather than throwing myself back into the pain of a race. But I hadn’t lost much time and a decent time of just over 3 hours was still very possible. So I picked up the cadence, and stuck myself firmly in the middle of the group. The next moment, as if to confirm my decision, Adele came past me with a “heya Rob“, followed by Peter just a few riders back. I stood and pumped up the short incline, and we charged down the long, extremely fast run down into Paarl. The rapid sequence of left and right turns switching through the back streets of Paarl were challenging, the group splitting and sprinting with each turn, making for a thigh burning couple of kilometres trying to stay in touch. Heading out towards Wellington though, somehow I was still there, now alongside Peter and chatting away. The pace was still uncomfortably fast, but enough endorphins were flowing through my veins now to dull some of the pain. The Garmin was smiling back at me too – our pace now having crept to 29.9, tantalisingly close to the magic 30.6km/h level that would revive the sub 3 dream. Skirting Wellington, we swung left onto the R44, and the second half of the ride. Initially the now fairly strong North Wester was a crosswind, but after the gradual climb up to Windmeul, the road swung south and we felt a welcome extra push of the the wind at our backs. The long climb out of Wellington had fragmented riders, different climbing abilities and speeds splintering the group, leaving small shards of riders dotted ahead and behind as far as you could see. With no obvious bunch to join, and a sequence of rolling hills and short fast descents ahead, I decided to just put my foot down and go as hard as I could solo. It was breathless stuff, but the kilometres started to evaporate rapidly with each surging ramp, and racing descent. I was a little nervous approaching the last rollers into Klapmuts. At this point I have started to cramp on every previous Die Burger. By now, I was holding nothing back and pedalling flat out – quads burning, and mouth open sucking in lungfuls of air to keep the engine going. I was passing riders too, and not just on the downhills: I joined and pulled away from at least two small groups on the uphills too. Despite the pain, I was loving it – my average speed had now crossed the magical 30k/h barrier, faster than I’d ever averaged before, and it wasn’t just because of drafting a faster group doing the work. I started to dream again – just 0.5km/h more and the sub 3 was still on. But the cruel thing about average speeds is they get harder to improve as time and kilometres move on, the distance behind creating a heavier and heavier anchor dragging you back. Knowing this, I told myself that I should easily beat 3:15, and that would be more than good enough as a result. Although the bunch had broken up, and Adele was far ahead by now, Peter and I obviously ride at a similar pace, and spent most of the R44 passing each other regularly, exchanging words of encouragement as we did. Even with the work rate and fast start, the rolling hills were now behind without any hint of cramps developing. I started the second to last hill of the day, Wiesenhof, with Peter just ahead of me – and soon pulled alongside him. Rather than pass though, I rode alongside and we chatted to the top, the main topic being the motivational thought that there was only one more, relatively small, hill to go before the finish. Crossing the top, I had lost track of split times and resorted to a quick mental calculation: there were something like 13km to go, including long stretches of fast riding, and just over 20 mins left on the clock. This was going to be close, very close. That realisation was all the incentive I needed, I stood up, stamped a frantic burst into my pedals, and tore into the downhill. The only thoughts that went through my head as we flew over those final kilometres was “don’t get a puncture, don’t get a mechanical, stay on the bike“. I’ve never been a fast descender, and the speed terrified me at times. On my first Die Burger down this same stretch of road I saw first hand what happens to a rider when a front wheel or fork breaks and they go over the bars at 60k/h. It’s a sobering sight, and wasn’t one I could shut out of my mind as we hurtled along. The relief as we swung the last left turn onto the R301 was enormous. The clock was reading 2:54, and we were almost there – less than 2km, and 6 minutes in hand. I started to dream again, and shouted across to Peter that we had a chance of a sub 3 here. He looked back at me in surprise, clearly unaware of how close we were to such a fast time. But as I stood to sprint the last stretch, the legs had nothing to give – they were dead and lifeless, and I was forced to sit and labour my way up the nasty short uphill from the turn. The top crawled into view, and I hit the big blade one last time, it seemed to take an age to get back up to speed, and the last sweeping bend seemingly endless. Peter passed me and I saw him pause, clearly conflicted with a sub 3 a few metres down the road, but also not wanting to drop me behind. I shouted across to him “go for it Peter, get the sub 3“. I heard the words “thanks …. “, and something else that I didn’t quite catch as he pulled away and made for the line ahead. Everything hurt – the tank was empty, the legs were gone, but the finish was there. I hauled myself out of the saddle, and launched the bike towards the big blue, Die Burger arch spanning the road, and a welcome release from the pain. The last race of 2012 was over, and just beyond the timing mats were Desiree, Adele, and Peter – huge smiles, hugs and congratulations all around as they had all gone under 3 hours. I didn’t want to look down, just in case, but I needn’t have worried. The Garmin smiled at me one last time – 2:57. Even allowing for small differences between my clock and the official one, I’d done it. My first sub 3, and despite many previous rides, my first real race. Just to round off the ride nicely, we found out later that both Alita and Elizna had also gone under 3 hours as well – Alita being particularly pleased to have bounced back strongly after a disappointing DC. The final irony of my faster riding was the smartness of Yoli’s bargaining – I was home before 10am, hardly making a dent on our Sunday. I knew the DC training had exacted a heavy price on our weekend family life over the last six months, so that Kenwood felt like a fair trade for such a memorable final event of 2012.